As far back in history as 4,000 B.C. transportation of food, merchandise, equipment, and other goods has been a necessity. Then, people used pack animals such as horses, donkeys, and camels to carry things from one place to the next over land. When the wheel was first invented in Iraq, the animals were hitched to carts to enable bigger, heavier loads. Not long afterward in Mesopotamia, the use of water transportation became a better and more efficient way of shipping more items. The use of canals was utilized. Small barges were floated on rivers and loaded with cargo. Believe it or not, canals were still used 100 years ago; the Erie Canal which was the most successful waterway in North America. It went from New York, through upstate Pennsylvania, and into northern Ohio, extending 425 miles. After two years of digging, it was used until 1913. Wind-powered ships with sails were later used in the open oceans for war, trade, and capture; to get goods from continent to continent. The last known ship to sail to America docked on July 9, 1860, with an estimated 110-160 African slaves. In 1812, the United Kingdom’s Middleton Railway was the first commercial railway to successfully use steam locomotives. Soon thereafter, tracks started going up all over the world and trains became the fastest and most preferred way to travel and transport merchandise. In 1988, Alexander Winton invented the “semi-truck,” and started another revolutionary way of shipping. When the Wright brothers invented the airplane, the world went crazy. Replacing ships, airplanes took transportation to a whole new height. Amid the tractor trailers, locomotives, and airplanes, boat shipping is still in use today, too. Interestingly though, boats are also used to ship boats. Amid the tractor trailers, locomotives, and airplanes, boat shipping is still in use today, too. Interestingly though, boats are also used to ship boats. How is boat shipping used for shipping boats? 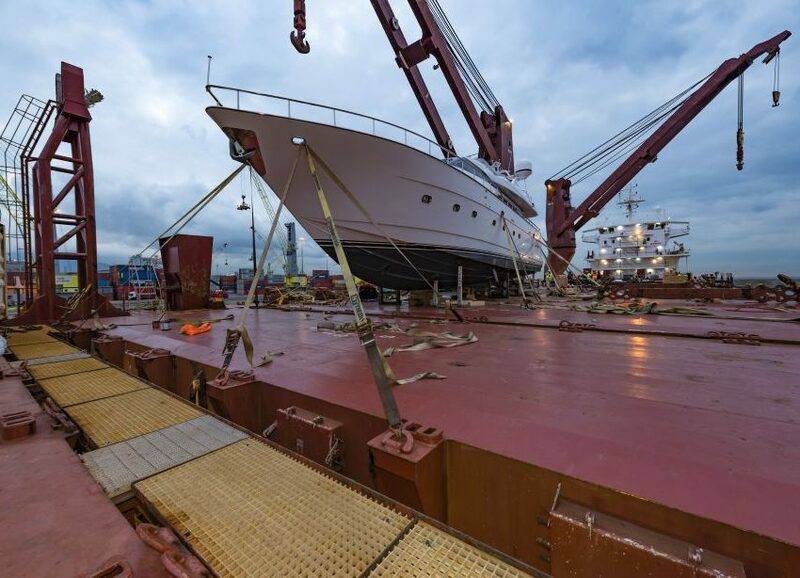 The United Yacht Transport Company, based out of Fort Lauderdale, Florida, specializes in transporting yachts via carrier ships across the ocean. Simply put, they used boats to transport boats. For instance, if you purchase a yacht from Canada, but want it shipped to you in Italy, you are in luck. This yacht transport business has boat shipping destinations that include East and West Coasts of North America, Mexico, the Caribbean, Asia, Costa Rica, Singapore, Greece, Hong Cong, Italy, Japan, Panama, Canada, and the Mediterranean. What makes United Yacht Transport boat shipping the best? The United Yacht Transport is above the rest because we are proud to not only be leaders in the business but are direct carriers who provide safe, reliable and cost-effective yacht shipping services. We also offer a 15% pre-booking discount. We have shipped more boats from the East to West coasts of North America than any other carrier. With one of the lowest boat shipping costs, we handle boats ranging in size from 30 feet up to 160 feet in length! We make certain that our customer service far outshines the rest – our slogan is: “Once you call us, we are sure you’ll call us for all your shipping needs.” Call today for a quote or go online to see the logistics, plan your route, or schedule a shipping. Trust the UYT to take good care of you! Expect timely and efficient deliveries, and never be late again for a showing or event. You really are in the best of hands. UYT = safe and professional yacht transportation! With United Yacht Transport, it is always smooth sailing! From beginning to end, we ensure that your boat will be safely handled. Visit us online and check out the testimonials from customers who have entrusted their boats to the UYT. A man from Southern California described United Yacht Transport as “diligent and professional” after we personally stepped in to handle difficulties that arose before the shipment.